It was a lovely evening last night. Lasagna was delicious. Company was wonderful and the opening reception of Paint A Miracle at Belian Art Center was fabulous. 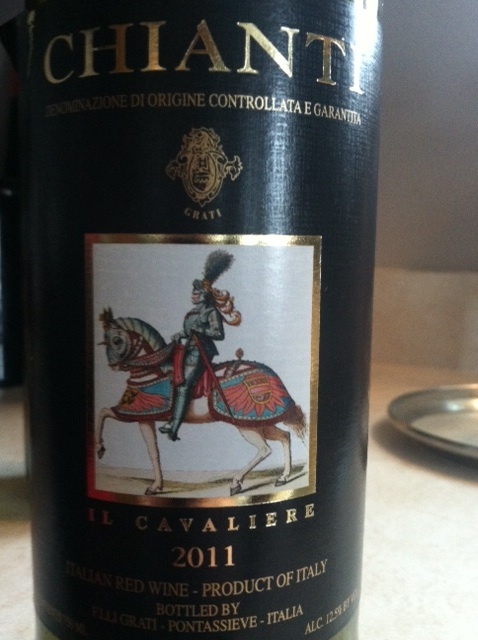 My husband and I decided that this bottle of wine, Chianti was the best one to go with the Lasagna. We had delicious bread by breadsmith brought by Cheryl English, a ceramic artist and master gardener, salad brought by Julie Wood, a budding ceramic artist and employee of GM, and yummy blondie brownies by Marilyn Appleman, a ceramic artist. She was accompanied by Michael Arndt. We missed a few other people that night at the opening reception and we hope to catch them all again next month. We showed up at Belian Art Center around 7:40 pm. Apparently if we had showed up earlier like at 5 pm when it first opened, it was elbow to elbow crowd going on. You could barely move. When we showed up, there were quite a bit of people, but at least we could move around freely. There were lots of wonderful pieces of work on display: Here is a youtube of what was on display at Belian Art Center and you can still get to see it this month since the exhibition runs until the end of February. We woke this morning, having our usual cup of coffee and breakfast. Then we proceeded to start getting cleaned up when we discovered our hot water heater quit working. So, no showers for us this morning. Hubs has to hit the road to travel for work tomorrow morning, so that means I have to deal with the repair myself. I had posted my problem on Facebook and am getting a lot of wonderful suggestions. Don’t know if my husband will take them in consideration. . . I need to get started on school work. It is early in the day. Let’s see how far I get with 50 papers to grade.